Whole body vibration (WBV) is a form of training and therapy that provides countless benefits for overall health and fitness including: enhanced strength, stability, posture, circulation, lymphatic drainage, metabolism, and flexibility; weight loss; reduction in pain from arthritis and fibromyalgia; and improvements in those suffering from hypertension, osteoporosis, multiple sclerosis, sarcopenia, and PTSD. WBV involves a vibration machine consisting of a plate that moves up and down, sending pulses of energy throughout your body. These vibration waves work to mobilize joints, activate muscles and connective tissues, and encourage overall alignment of your body’s bones and tissues. Vibration therapy has been proven to increase circulation of blood and oxygen throughout your body, leading to the numerous benefits – and more – listed above. It has also been shown to reduce stress and recovery time from workouts, falls, or injuries. 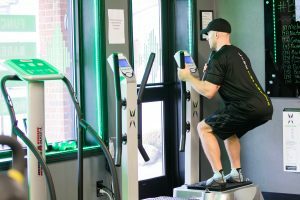 For additional information about Whole Body Vibration, contact us at info@beat-fitness.com or give us a call 724.900.0323. If you’re interested in purchasing a HyperVibe Machine, use our promo code, optimalhealth for 10% off for any vibe machine and FREE SHIPPING.